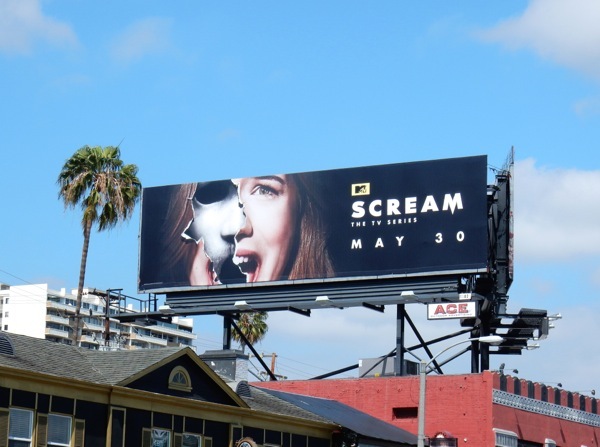 Are you ready to go back to Lakewood for another blood-soaked killing spree, as the sophomore season of MTV's Scream series is back to play its deadly mind-games once again with the plucky group of teenage survivors from the first season. Having survived a murderous podcaster out for revenge, can Willa Fitzgerald's 'Emma' and friends get through another ten episodes of the slasher film franchise spin-off in one piece, or will some of them end up in many pieces. 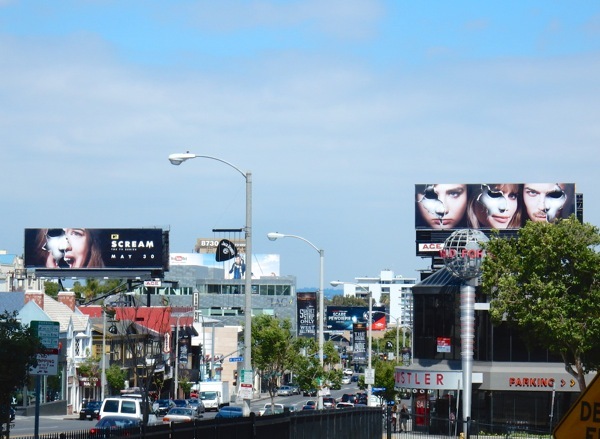 This duo of interconnecting billboards for the second season of Scream: The TV Series were snapped on opposite sides of West Hollywood's Sunset Strip on May 9, 2016. 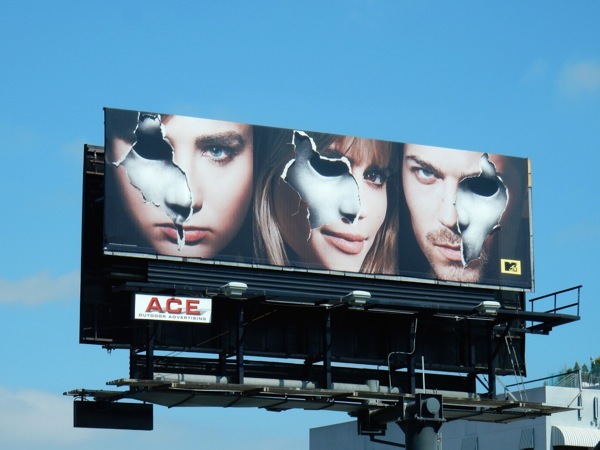 There's something about this billboard design which is hauntingly familiar and it certainly evokes the horror genre, with the torn away face revealing portions of the Ghostface killer's mask beneath also reminding us of the recent Making a Murderer Netflix billboards. 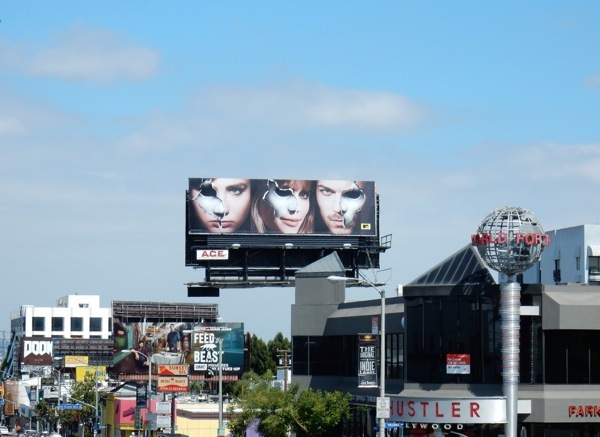 Fans of the show can also enjoy these Scream season one billboards from around L.A. last Summer. 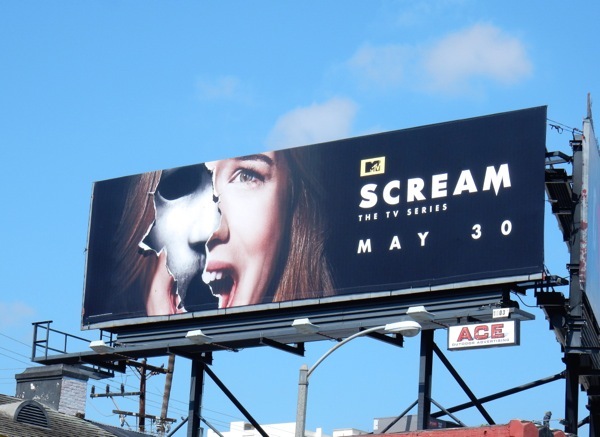 Whether they be remakes, reboots or prequels, most TV show spin-offs of movies are lucky if they last more than one season, just look at Minority Report and Rush Hour for recent failed examples, so MTV's Scream scripted series has done well to stay alive this long. Only time will tell whether the grim reaper comes to claim more than just teenage victims in the show's future.